You are here: Home / Newsletter / Is Your Nursing Co-Worker Impaired? 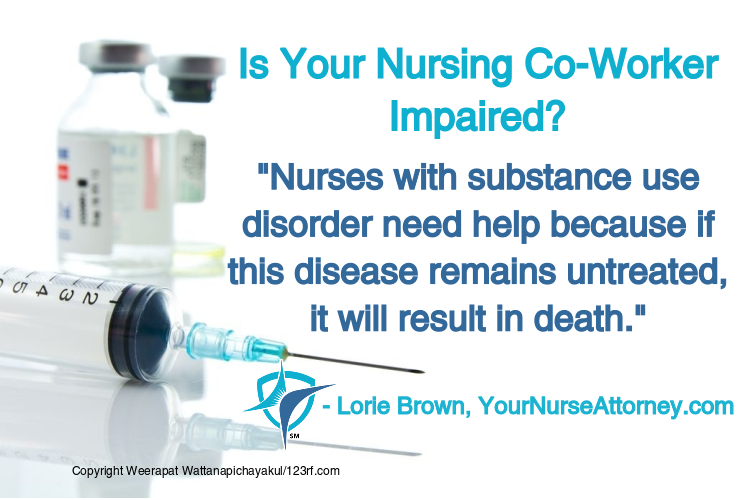 By the number of cases before the Board of Nursing positive drug tests, not wasting properly, Dui’s I suspect the number is higher among nurses. I have also seen false allegations , with no evidence. I have worked with 3 nurses who had substance abuse problems. I did not know about it until they lost their jobs. I would like to think that the nurses today will receive better support from the workplace before terminating them.. I may be too optimistic. Thanks for your comment Sheila. Many hospitals are willing to work with nurses who voluntarily seek help from the EAP before the start diverting. Once diversion starts, the many hospitals consider it theft and can result in criminal charges. That is why it is important that we help our co workers so they can get the help they need.